This is the first step–pardon the pun. 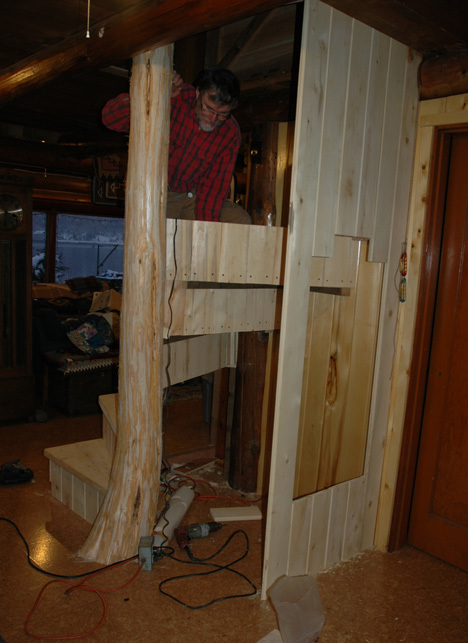 Designing a circular stairs about a log isn’t that bad; just tear up your plans and build it step at a time. Each of the eight steps gets 22.5 degrees and elevates 10-9/16″ which will take you 180 degrees and 95″ in height. Build a pattern with this angle and apply to each step. Here we are half way; it took me about a week to complete everything averaging two steps a day. 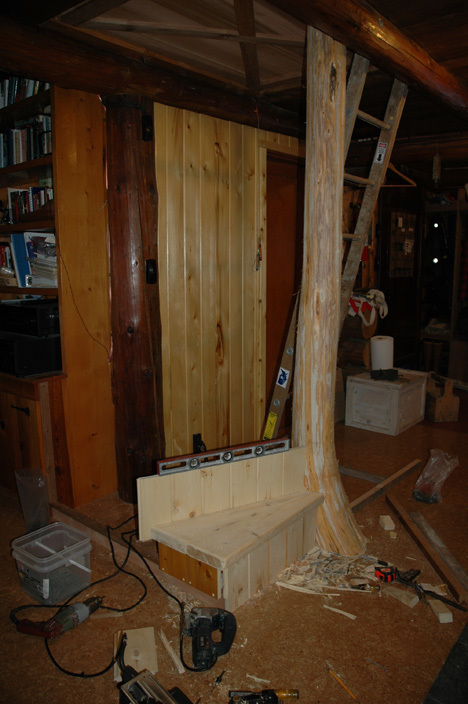 The problem was building in the woodbox (opening on right) and bench. Any changes required me to dismantle everything in reverse order; kind of like a Chinese puzzle or Rubic’s Cube. Here’s the final product complete with a red cedar lid to keep the heat where it belongs and a bench matching our Tulikivi ‘hot seat.’ Now this is a set of stairs for a carpenter on the way up! This entry was posted on Monday, January 21st, 2008 at 11:00 am	and is filed under Alaska. You can follow any responses to this entry through the RSS 2.0 feed. Both comments and pings are currently closed.